Do you remember everyone in your school photos? I don’t. There was a time, of course, when I knew everyone but now after 50 plus years the names and memories have faded. Not all. Some people I remember because they were friends or, maybe, enemies. There are others that I can recall because they are associated with a particular event. I remember Detlev because his mum always dressed him lederhosen as it was “long wearing” but poor Detlev had to put up with a lot of teasing which nowadays would be called bullying. And I remember Robert Robertson because his name wasn’t very imaginative and he was also the first to break loose from school, to become a postman. There was “Chooky” who had an unusually shaped head but was a great footballer and we had the same birth date. Similarly, I can’t remember all my teachers’ names apart from those that I liked a lot or loathed. Mrs. Fisher was ahead of her time. Her classes were interesting and varied and she always had something in her “dilly bag” to show us. Mr. Austin in contrast was stern and humourless and his music lessons consisted of humming in tune with a tuning fork. I remember getting “six of the best” on numerous occasions. I am not saying I didn’t deserve them but it didn’t help me like him either. My school photos also come from a time when life was in black, white and shades of grey. Colour hadn’t arrived yet. I wonder if that affects our memories? Do colour school photos make the time seem more pleasant? We were regimented into lines in the photos just as we were lined up and marched into school to the sound of a scratchy old record over the PA system playing “Colonel Bogey”. 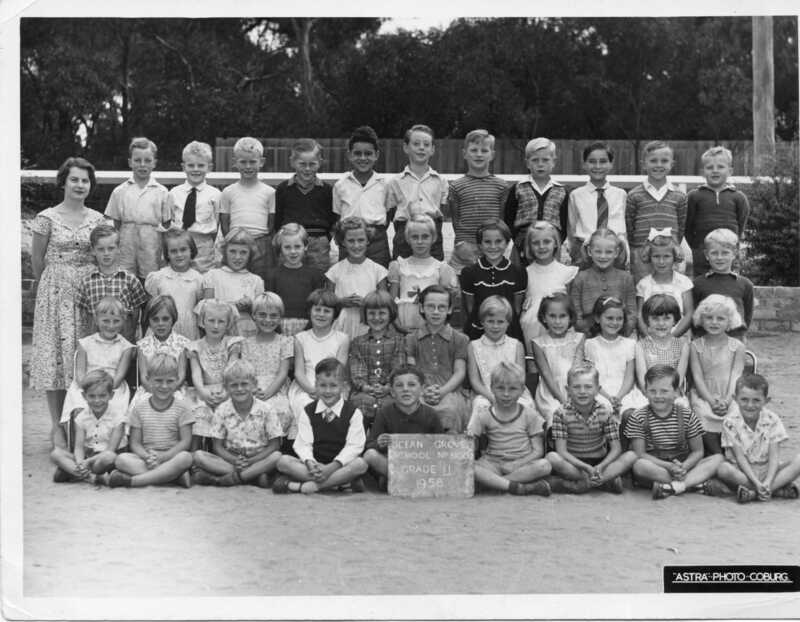 But one can’t help wondering as one looks at the 43 students in the Grade Two photo what lives the other 42 have lived and how many have passed on. What has happened to Ron, Peter, Sue, Vera and Olga and have Detlev’s lederhosen finally worn out? Have some of the others been better at keeping in contact than I? I’ve had the same experience looking back at old school photos. Funny isn’t it how things that made up our world at one time seem so distant and insignificant as time passes, and yet they come together to make up who we turned out to be. Thanks for a great post! Thanks Don, a great reflection. There are all these little chisel marks over the years that make us the sculpture we are today!